Achieving and maintaining a healthy body weight can be a struggle. As discussed last week it is important to understand your ideal weight first. 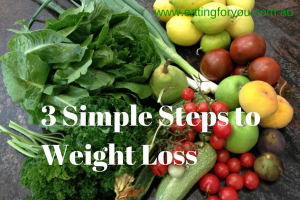 My 3 simple steps to weight loss put you in charge of your food choices. It is an exciting time for nutrition, as the recommendations for healthy eating from Western science are merging with those from the Eastern modalities of Ayurveda and Traditional Chinese Medicine. Is your eating motivated by pure physical hunger or other reasons such as boredom or stress? Do you know what, when and how you eat? Do you have a daily eating routine, or do you have a random approach to eating? As mentioned previously, a food diary is a great way to reconnect with your way of eating. This is vital information, as it allows you to identify whether it is the food you are eating or your reasons for eating that you need to change to support healthy weight loss. Eastern medicine for thousands of years has encouraged us to tune into our bodies and our environments, to assess how our food and lifestyle choices affect the health of our mind and body. We are all individuals, so knowing how we respond to different foods and quantities of foods is important. These choices ultimately influence whether we can achieve weight loss. Traditional Medicine, the Australian Dietary Guidelines, the Mediterranean Diet and emerging research on gut bacteria provide similar guidance on food for weight loss. Vegetables, legumes and lentils — fresh vegetables are best, but frozen and canned varieties are a useful substitute. Dried legumes and lentils are an economical buy and store well. Fruit — fresh and in-season varieties are best, but canned and frozen are a good choice when fresh fruit is not available, of poor quality or too expensive. Whole grains that are minimally processed, such as rice, oats, rye, barley, quinoa and bread that contains wholemeal flour and whole grains (you can see the grains). Traditionally made sourdough bread offers additional benefits by decreasing the Glycemic Index (rate at which digested sugars enter the blood stream). Dairy products with no added sugar. Other animal products such as red meat, poultry and fish, but not processed meats such as smoked meats or sandwich meats. Whole foods provide a balance of nutrients and phytochemicals such as antioxidants and other natural compounds that decrease inflammation and boost our immunity. They are a good source of dietary fibre and they are also lower in kilojoules than highly processed foods — these factors are well recognised for their role in assisting weight loss. We now know that nutrients, phytochemicals and fibre from plant foods are essential for healthy gut bacteria. The health of our gut has always been a focus of Eastern medicine, with the belief that health and illness stem from the gut. If we have a healthy gut, then we will enjoy good health. Western science is uncovering the varying roles of gut bacteria in the health of the mind and body, including weight loss. Early experiments in mice demonstrated that gut bacteria influence body weight, initiating broader research to better understand the role of the gut microbiota. We now know that we need to base our meals and snacks on whole foods to achieve and maintain a healthy body weight. salty foods including savoury snacks, processed meals with added salt, take away meals with added salt, canned foods with added salt, sauces. Highly processed foods hinder weight loss due to their high kilojoule content. It is very difficult, and impossible in many circumstances, to increase your activity level and energy expenditure to counteract the energy content of highly processed foods. Recent health surveys show that Australians are having over 30% of their daily energy intake from discretionary (highly processed) foods. Initial weight loss is supported by a decrease in energy intake of 2,500 kilojoules. Reducing or eliminating discretionary foods, as the table below shows, is the way to go. Highly processed, or discretionary, foods have the opposite affect on our gut microbiota to whole foods. Our gut contains different types of bacteria, some support our health whilst others detract from our health. A diet that is based on highly processed foods is associated with poorer mental and physical health. For example, highly processed foods feed bacteria that contribute to weight gain and inhibit weight loss. Highly processed foods feed bacteria that contribute to weight gain and inhibit weight loss. The full story concerning the role of gut microbiota on body weight and health is yet to be uncovered, but the good news is that dietary advice to eat whole foods and reduce highly processed foods will support weight loss and optimal health for our mind and body. 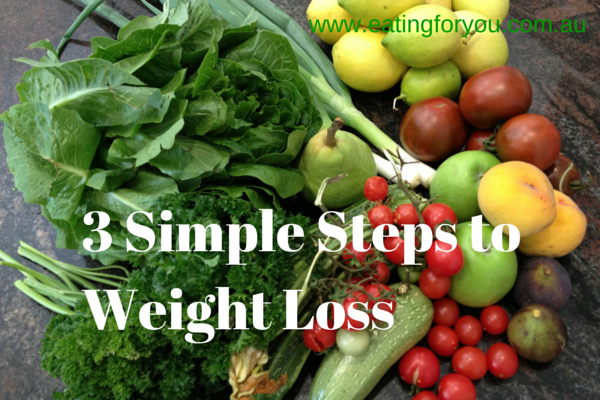 My 3 Simple Steps to Weight Loss can be summarised as ‘mindfully eat whole foods’. As I have encouraged previously, keep a diary and track your reasons for eating. Record why, what, when and how you eat. Increase the amount of whole foods you eat — take time to explore new ways to enjoy the flavours and health benefits of vegetables and legumes. There are many good reasons to reduce discretionary foods, but if you still wish to include your favourite ones, enjoy them as an occasional, rather than, daily option. 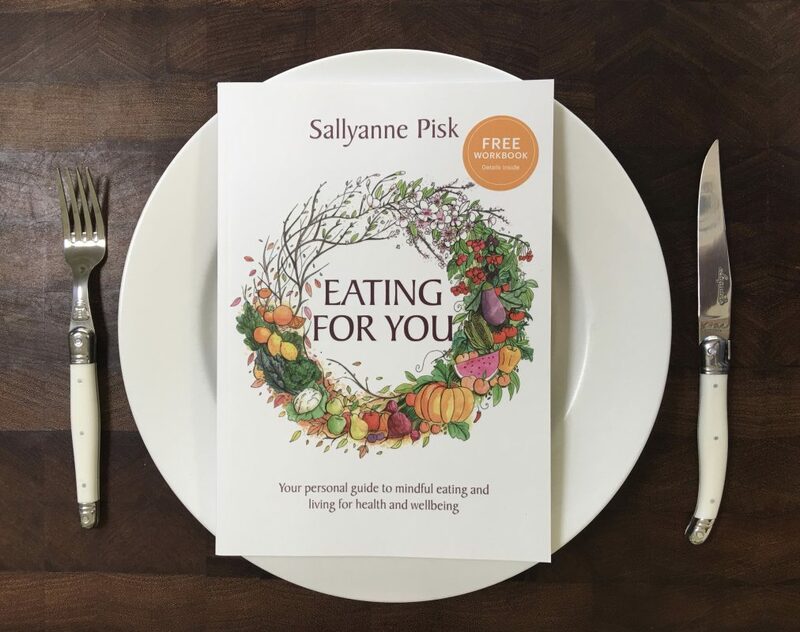 Take a look at the Eating for You Book. It offers personalised guidance on making eating and lifestyle choices.